October 16th is recognized as Dictionary Day, being the birthday of Noah Webster who was born on this day in 1758. Go ahead, read a dictionary today! Vintage bookcloth from discarded books is used to make the covers for these journals; the endpapers are also selected from old books so these are truly unique handmade journals. 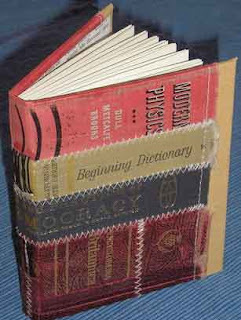 This one in particular has some great dictionary spines on the cover, making it an apt pick for Dictionary Day. That journal is amazing. I've never seen one done like that before. Gorgeous. What an awesome and unique book! I love it!